Such a great comfort food for fall and winter! 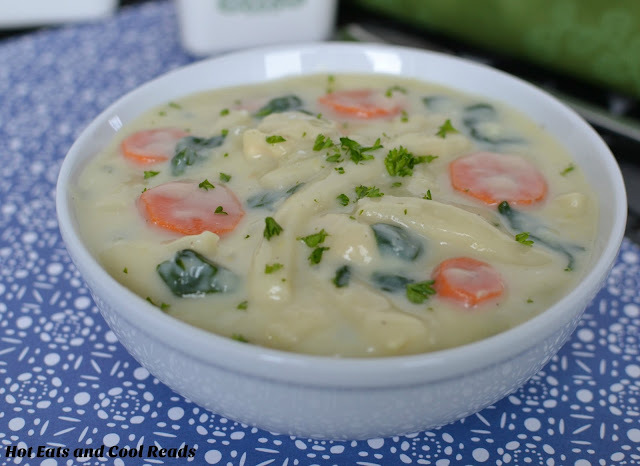 This soup is packed with tons of vegetables and is so delicious! Plus, the addition of cream cheese makes this soup extra wonderful! It's fall in Minnesota, and that means it's soup weather! Woo-hoo! I was in Arizona for a food blogger conference and short vacation last week and weekend and it was around 100 degrees. I'm a true Minnesota girl and couldn't wait to get back to the 60-70 degree temps here! 100 is a little too warm for me, even with it being a dry heat. Arizona was tons of fun! I visited Windmill Winery in Florence for the blog conference, then went back to Phoenix to meet with my family, headed to Scottsdale, and also Jerome and Sedona! We went on a jeep tour through the red rock in Sedona, visited the ghost town in Jerome and hung out in Old Town Scottsdale. I will be posting about some of my adventures in future posts! I swear I could live off soup in the fall and winter months here in Minnesota! There's nothing like a huge bowl of homemade soup to keep you warm! Soups are also a favorite here on the blog! My readers absolutely love the Beefy Tomato Macaroni Soup, Creamy Zucchini and Carrot Soup and also Creamy Potato, Sausage and Sauerkraut Soup! I'm pretty sure this one will be a new favorite too! I absolutely love Reames Homestyle Egg Noodles! They are just like homemade, but take no time or effort to make! Just throw them in the soup pot to cook and they're done when the soup is! You can find them in the freezer section and I always make sure to keep an extra bag on hand just in case. I especially love the spinach in this soup! It adds flavor and nutrients and it's budget friendly too. One last thing about this soup... cream cheese! Yes! That's the ultimate secret to making this soup taste amazing! What is your favorite soup, the one that screams comfort food to you? In a large soup pot, melt the butter over medium high heat. Add the onion and garlic, saute for 4-5 minutes, until tender. Add chicken breast, chicken broth and carrots. Bring to a boil. The add the noodles and simmer for 15 minutes until noodles and carrots are al dente. Reduce heat to medium if needed. In a bowl, whisk together the flour and milk until combined. Stir into the soup along with the cream cheese, spinach and parsley. Simmer for 5 minutes until soup is thickened. Season with salt and pepper as preferred. Remove from heat and serve with a chunk of crusty bread or crackers. I agree...I could live off soup all fall and winter long. 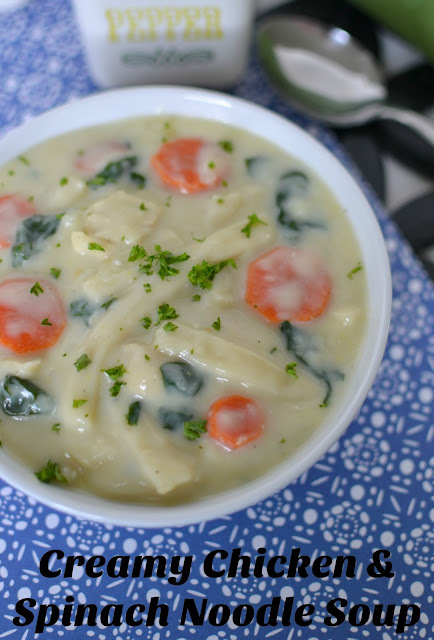 Adding spinach to this creamy chicken noodle soup is such a great idea! I live in Phoenix (couldn't make it to Blended)! Glad you had a good time, and YES, it is ridiculously hot here (although this week has been awesome)! I might wait a month or so before I try this soup, but it looks so good -- so creamy and noodle-y! 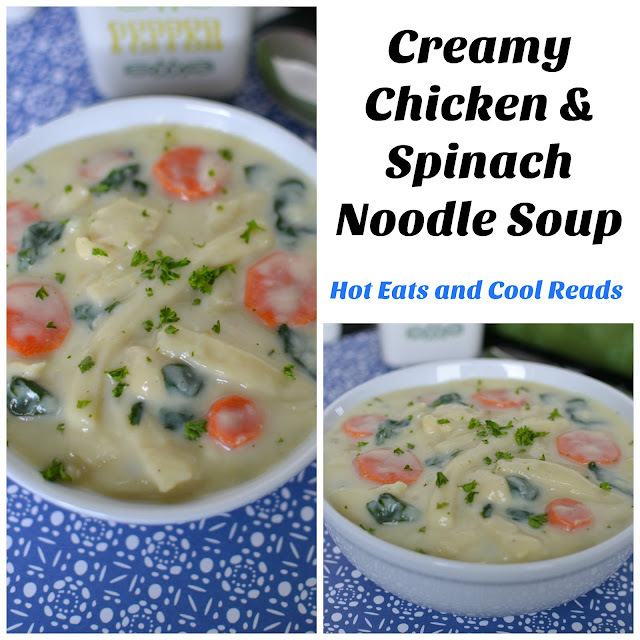 This soup looks so delicious, especially those noodles! I miss that fat, chewy delicious noodle soups - maybe, someday, they'll make a gluten-free version because I'd love to have them in my soup too! This place doesn’t have any 'i'm too cool and busy for you' wait staff. As per me, everyone at venues in Los Angeles is nice, friendly, and helpful and they really seem to like their jobs there and that is important to me. We had an awesome experience here.